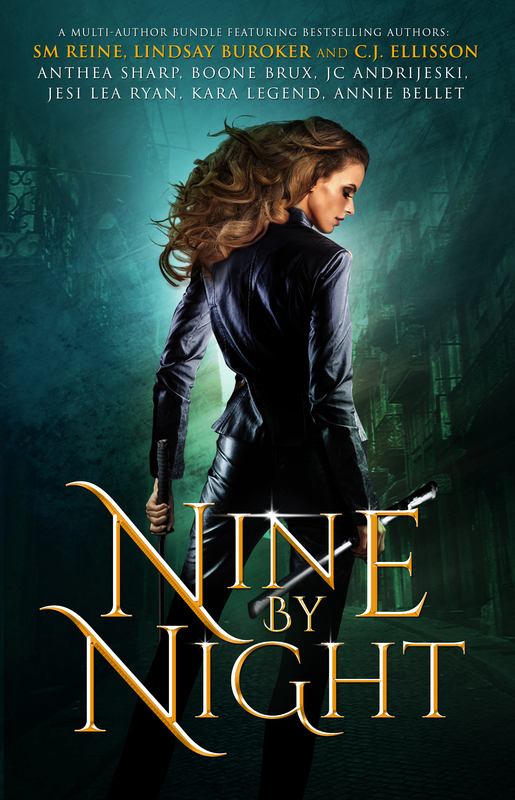 A little while ago I offered my blog for a cover reveal of Nine by Night, a collection of 9 urban fantasy novels. I also got an advance review copy of the book in order to write some reviews! So here are my thoughts on the stories from Nine by Night that I’ve read so far. More to follow! You can purchase the collection on Smashwords or Amazon for $0.99 for a limited time! This book is worth reading just for the miles-a-minute twists at the end. But there’s much more to it than that, I promise. As the first book in a collection of 9 urban fantasy novels written by women, I was expecting a story narrated by a female protagonist. Pretty stereotypical thought for me to have, and I feel a bit guilty about it, so I’m sorry. Moving on. Once I got over my initial disorientation, this story gripped me from start to finish. At its heart, this story is a mystery novel in magical clothing, which in my opinion makes it much more fun than a regular mystery novel. Our leading man is Cesar Hawke (great name, btw), and he wakes up to find himself accused of a murder that he has absolutely no recollection of committing, not to mention he doesn’t consider himself a killer by any means. He must go on the run to uncover the truth about what happened that night, and the adventure is never dull. Like I said before, towards the end there are a variety of twists and turns. But while this can often clutter the story, author Reine executes them beautifully. I was never once confused without a good reason (usually right along with the main character), and I liked the fast pace of solving the mystery at the very end. The characters were all believable and had distinctive personalities. I hope in future novels in the series we can learn a bit more about their backgrounds, and maybe even see Cesar interact with his sister. I really enjoyed the sense of humor in this novel. Through all the drama I had a lot of laughs, and I think the humor would appeal to both men and women (as long as you’re not too uptight!). I absolutely loved this one. It’s shorter than the others I’ve read so far in this collection, but it’s one of my favorites. The main character is a female gamer and comic-book-store-owner, and on top of that – she’s got some real magic up her sleeves. Our heroine, Jade also extremely brave and capable when it comes to protecting those she loves. The story centers around some dark magic that’s been used to freeze a bunch of shifters in their animals state to gain power from them. It’s pretty dark, but the author has a great sense of humor that gets pulled out at all the appropriate moments. Werewolves are all right, but I love seeing a bunch of characters that happen to be people who turn into animals and AREN’T consumed by wolf-pack mentality. This type of shifter story was extremely refreshing in that regard. I also enjoyed the little bit of romance weaved into the plot, because it’s not the focus, and it has plenty of room to grow in later books. I’m pretty sure this is the first urban fantasy novel I’ve read whose heroine is also a total nerd (all the sci-fi/gamer/fantasy/etc. references were excellent), and I can’t wait to read more of Jade’s story. This story was really fun. I can’t remember the last time the opening chapters of a book terrified me as much as these did. I made the mistake of starting this book right for bed and couldn’t stop until the main characters were safely back in civilization. You see, the beginning of this novel brought back scary memories of watching The Descent. But if you can make it through those first couple chapters, the plot thickens considerably. Our heroes are archaeologists, which is a fun twist for this genre that I haven’t seen before. Their chosen profession is hunting for archeological treasure and selling it for profit. Not super lucrative, but they get to travel around in a camping van that has so much personality, it’s practically a character all on its own. As far as I can tell, this story doesn’t follow any of the well-known mythical creature myths that I know about, which makes it all the more interesting. It is very much a mystery that gets weirder with every chapter. The author also has a fun sense of humor. I absolutely love the character of Simon, who is a total nerd, and also hilarious in his own right. Delia is our curious, intelligent heroine and I find her to be a very relatable character. She is more or less following her dream to become a female Indiana Jones, and while it’s not as lucrative as she might have hoped, she stands by it because it’s fun. I wish I could be so brave. Temi is a bit of a mystery, but I’m looking forward to seeing her character grow. There are so many strange happening in this book it’s a wonder I can keep it all straight – but the author is clearly talented, and I’m able to hold it all together until the final reveal… Which is only a half reveal. There is clearly a lot more left in this story, and I can’t wait for book 2! This book is fantastic! One of those books I got so wrapped up in I couldn’t put it down. Cady’s story is unique. She’s a twin who suffers a psychic break after her twin sister is killed, and gains herself a bit of a superpower – empathy. Add that to the craziness of high school life, and you have a supernatural novel full of conflict, excitement, adorable moments, and an idea of what it’s like for a family to lose a child and a sister. All these things are weaved together brilliantly by author Jesi Lea Ryan. Cady is a really fun character, too. She’s just your average teenage girl until her whole life changes in one terrible moment. She handles herself well, and is completely believable as a teenage girl. Cady is definitely someone I’d love to have been friends with in high school. Once again, a romantic subplot is woven into the story without becoming the focus and taking away from the overarching plot (which if you can’t tell by now is my favorite style of romance-writing). There’s a hint at a love triangle forming, but rather than rooting for one of the boys, I am Team Cady, all the way. She is a very strong young woman, and I can’t wait to read the final chapter to her story. Book 2, Arcadia’s Curse is out now, soon to be followed by Arcadia’s Choice later this year. I enjoyed Curse even more than Gift so I can guarantee that the sequel won’t let you down. Once again, you can find the book for sale at Smashwords and Amazon releasing at $0.99 for a limited time! That’s only $0.11 per book! It’s almost like stealing, but instead you’re supporting 9 independent authors! Go you. That’s all for now – I’ll post the rest of my reviews either here, on Goodreads, or on Amazon as soon as I finish reading the rest! Thank you! Not particularly? I mean, in case you haven’t noticed, there’s not much rhyme or reason to what I decide to blog about – just whatever I’m most interested in at the time. Generally, I keep my book reviews on Goodreads only, unless someone specifically asks me to write a review on Amazon or something. Writing book reviews on my blog feels a little bit like cheating since I also write them on Goodreads. But this was a little different since I was given an advanced review copy. I figured I’d do it justice and get my review on as many websites as possible for these awesome ladies, several of whom I call friends.